The Gizmo is available from Vintage Components (Tony Williams), see this page for product and ordering details. 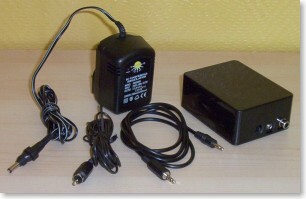 It is a fully assembled unit with power supply, audio lead and aerial wire, costing £39.95 plus £4.00 postage and packing. Being a fully assembled unit, the circuit diagram is not published by the manufacturer, although an unofficial copy is available on the Gizmo page at the Medium Wave Alliance archive site here. The unit uses a crystal oscillator and divider circuit to generate a 9kHz reference frequency, which feeds a phase-locked loop and divider circuit to generate the required carrier frequency. The frequency is set by eight DIP switches on the board, following a table in the manual. The oscillator circuit operation is similar to that of the AMT3000 unit. The modulator uses a long-tail pair arrangement, with the audio feed directly to the constant-current circuit. 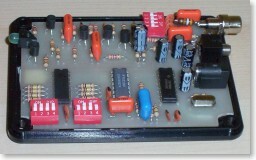 The RF output is tuned by an inductor and four selectable capacitors. The whole circuit is powered by a plug-in regulated 12V power supply adaptor. Frequency setting is straightforward. Locate a quiet area on the MW band, preferably using a digital tuner so you know the exact frequency. Look up the frequency in the manual and set the DIP switches to suit. Connect your audio input, the aerial and the power supply, and you're ready to go. You can connect either a stereo or mono input (the audio lead contains a resistive mixer for stereo), but it's quite low impedance so it really needs to be connected to a headphone socket. No audio level adjustment, so again the headphone socket is better because the level is set by the equipment volume control. Unfortunately the unit suffers from quite serious interference from the digital circuits. At low volumes there is a small but certainly not insignificant amount of background "mush", and when the radio is slightly off-tune this mush is much more noticeable. This detracts from the unit significantly in my opinion. I contacted Tony Williams a couple of times about this, including a suggested modification that I found help to minimise the problem, but he didn't replied despite several reminders. The lack of a fine adjustment on the antenna matching means that you cannot achieve the maximum possible range from the unit. However the range achievable is probably adequate for our intended purpose. With the unit located upstairs and tuned to 531kHz, I had useable reception in adjacent rooms, but it was a struggle to get decent reception downstairs, and it was lost in the background noise out in the garden. At higher frequencies the range should be better, so care may need to be taken to ensure it does not cause interference to neighbours etc. Due to the interference problem and the reluctance of the manufacturer to discuss this, I cannot recommend this unit. I would advise you to consider other products reviewed in this section instead. The unit is manufactured by Vintage Components in the UK. The price is £39.95 plus £4 P&P. Online ordering is available, with payments by PayPal. You can also pay by cheque or money order if you prefer. A few people have asked about the modifications I carried out to the Gizmo. I have now included details here.